Metal Hole Punch Pliers, 1.8mm~These are great to punch holes in your bottle caps to make necklaces, bracelets, ornaments, hang charms from, etc. This tool will punch a 1.8 mm hole in metal sheet stock up to 20 gauge; ideal for cold connections and creating pendants, creates a smooth hole with no rough edges or dents in sheet, extra long jaws for extended reach and a bonus replacement pin included. I used this on some of the samples I recently posted and worked great. I am a tool junkie anyhow and I do have other tools for punching holes like the Crop-a-Dile and the rectangle bar shaped hole punch that will punch on both ends- don't know what technical name is- both of thes work wonderful but they don't work very well on the bottle caps. So this tool is invaluable for them. You can also punch holes in bottle caps using a wood block beneath you and a nail- and I have- but this is so easy and clean and sweet. You can also use this for punching holes in brass blanks- works great and it is a very clean punch. It comes with instructions on the back of the package-especially for using the gauge guard (which is the back screw like thing closer to the handles). 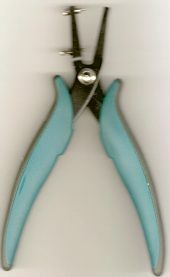 Metal Hole Punch Pliers-1.5mm Size~These are same as the pliers above except that are 1.5 mm. Use for 1.3mm rivets.